Do You Need a Compelling Reason to Join the Turbo Diesel Register? 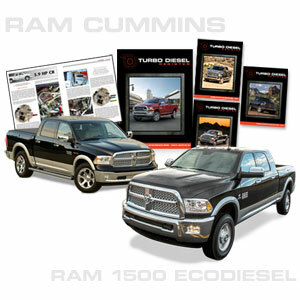 Ask us about the new Ram 1500 EcoDiesel and its options; features and benefits; fuel mileage; and performance. Ask us about aftermarket accessories for the 1500/2500/3500 consumer pickup trucks. Ask us about work truck accessories for the 3500/4500/5500. Ask us about biodiesel fuels. Ask us about technical service bulletins, product recalls and software "flashes" that may apply to your truck. Ask us about the 12-valve engine's "killer dowel pin." Ask us about Block-53 repair and the engines that are affected. Ask us about the '98.5-'02 24-valve engine's need for adequate fuel pressure. Ask us about DPFs, NACs, DOCs and the Cummins 6.7-liter engine's emissions aftertreatment components. Ask us about the relationship of diesel fuel prices to crude oil. Ask us about lube oils, brake pads, antifreeze, performance boxes…the list is endless. Stay informed and up to date. Start your subscription to the Turbo Diesel Register now. A one-year United States subscription to the TDR includes 4 copies of the TDR magazine mailed quarterly and 12 consecutive months' access to the TDR website. "Great service and fast with a bonus gift package was a nice surprise! Great staff, pleasure to work with. That's why I've come back many times."